On its own island on the central road running through Kingston Cemetery. The Memorial is about 5 metres high and is made of pink marble. Most of the names are inscribed on the upper plinth but there is a separate plaque on the lower. In his book "Freemasonry in Hampshire and the Isle of Wight", F.D. 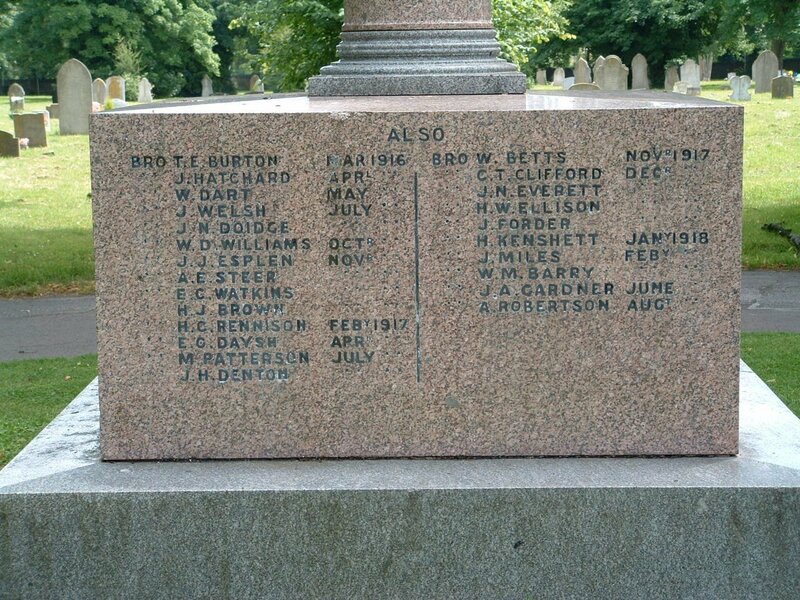 Laugharne refers to this memorial in Kingston Cemetery calling it 'Possibly the only Masonic War Memorial'. 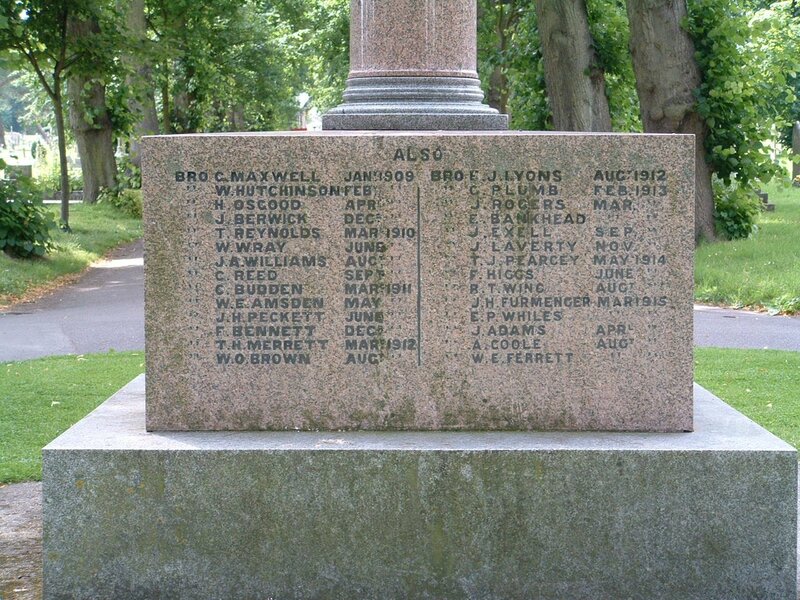 If it should indeed be thought of as a War Memorial then as of the date of writing the Freemasons are probably the only ones who are aware of it as neither the Cemetery Manager nor the Commonwealth War Graves Commission (CWGC) regard it as such. Laugharne goes on to say that the memorial was erected in 1898 (by the Brethren of United Service Lodge No. 1428) to commemorate members who had lost their lives in the service of their country. 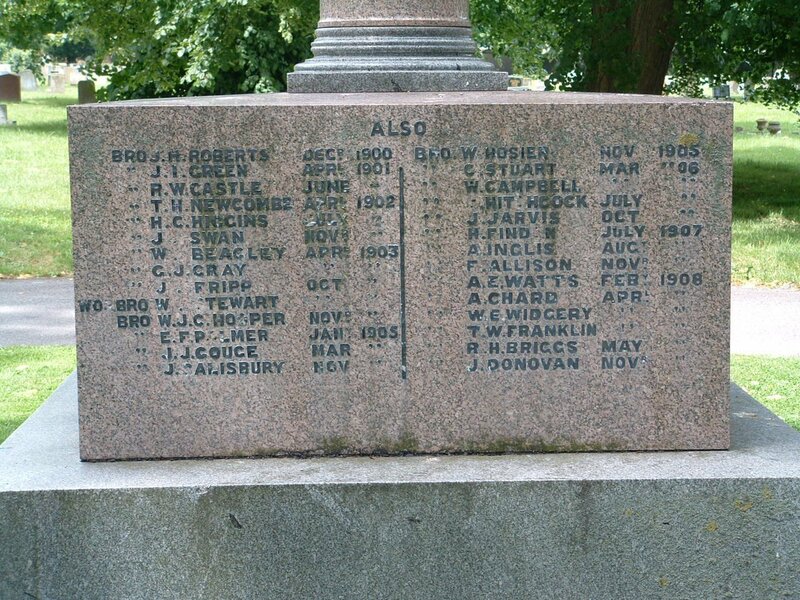 This is difficult to interpret as only the first 23 names, plus the 3 on the lower plinth, had died by 1898. 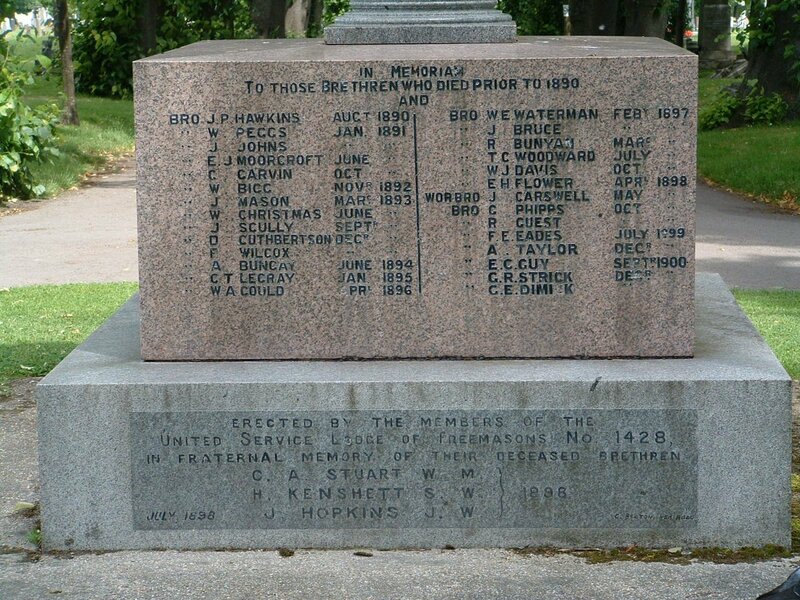 It is possible that the memorial was originally erected solely to the 3 members named on the lower plinth and that it was subsequently decided to extend the list on the available space above it. It is currently rather difficult to confirm that the brethren who are named as dying before WW1 gave their lives in the service of their country, but those from 1914-1918 can be checked against the CWGC database, though in some cases there may not be enough corroborative evidence for positive confirmation. The research on these names is shown below and as can be seen a large proportion are unidentified which suggests that they did not lose their lives in the service of their country. W DART - No record at CWGC; DW Dart does appear on the Guildhall Cenotaph, but this man probably died in October 1916. J WELSH - Lieutenant RN, John Welsh, died 3rd July 1916 aged 56, buried in Kingston Cemetery. AE STEER - Chief Stoker RN, AE Steer, died 9th November 1916, buried in Milton Cemetery. J FORDER - Chief Petty Officer, RN, J Forder died 11th December 1917, buried in Milton Cemetery.